While not technically not a fashion exhibition, this show at the National Gallery of Art in Washington, DC in 2013 is one of my all-time favorites. I’ve said before that it you want to really understand the fashions of the Teens and Twenties, you have to look at the work that was done by the costumers and set designers of the Ballets Russes. Scheherazade,first performed by the Ballets Russes in 1910 that set off a fad for Orientalism in fashion that lasted into the 1920s. 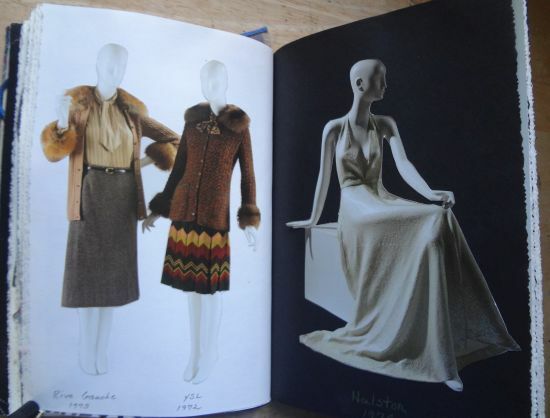 Even the great couturier Paul Poiret was influenced by the movement, even though he downplayed it in his autobiography. So much of the beauty of the Ballet Russes costumes is in the attention to detail. 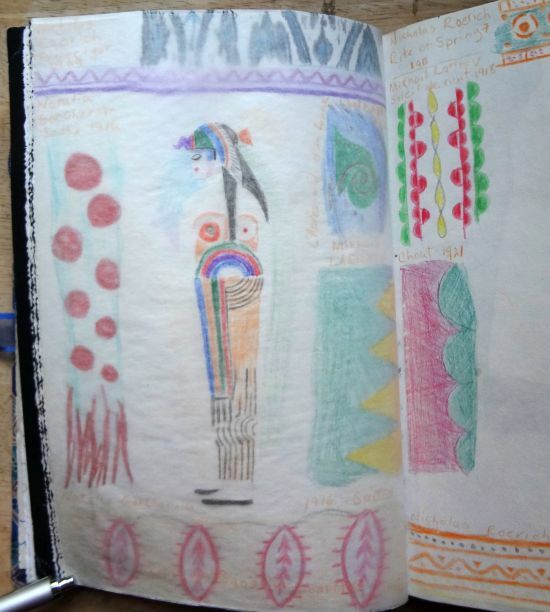 In my journal I made a border of the ones I found to be the most interesting, and in the center, on a piece of translucent paper, I drew Sonia Delaunay’s magnificent costume for the 1918 production of Cleopatra. 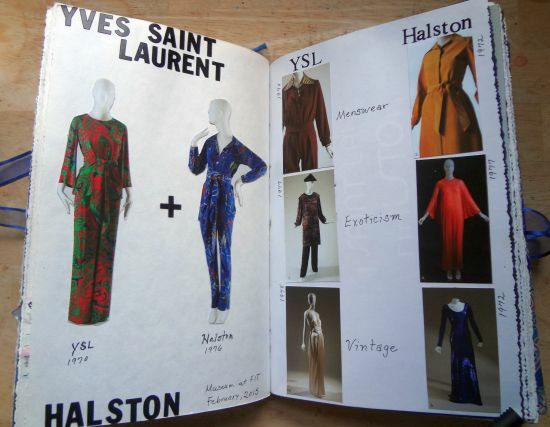 Back in February I was lucky to see this exhibition at FIT, Yves Saint Laurent + Halston: Fashioning the ’70s. 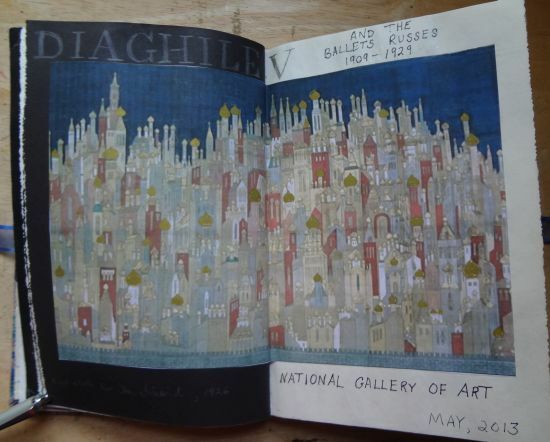 I usually like to take my exhibition journal and do drawings on site, but in some cases that is just not possible. For this trip I didn’t even take the journal with me, as baggage was tight. Also, I knew that I could depend on FIT to provide excellent brochures about each exhibition. I was glad that I had decided not to try and sketch. I had two friends with me, and sketching takes time. And there is so much to do in New York and we had so much to see. But the big reason I decided not to try sketching on site was because the Museum at FIT is always very busy. People are constantly moving around the exhibits and it is hard for me to concentrate with so much activity. One gallery has seats which are nice for drawers, but others do not, and I can’t draw standing. So instead I took lots of photos of the details, planning to do my sketches later. That didn’t happen though, as I just had so much going on in my head with all the other excitement from the trip. So I decided to rely on the materials provided by FIT. Because of that, this journal entry focuses more on what the curators wanted me to take from the exhibition rather than my own observations. That’s not ideal, but sometimes it just has to be that way. Probably the biggest takeaway from this exhibition is how time gives a clearer vision as to the zeitgeist of an era. 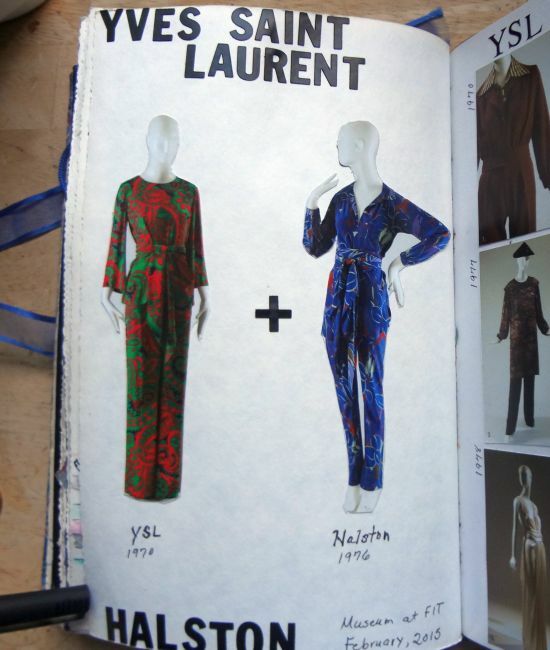 In the 1970s I don’t think many people would have been able to look at the work of Saint Laurent and of Halston and see how they were both pulling from similar influences. At the time the differences overshadowed the similarities. But using that marvelous tool called hindsight, we can step out of the era to see where both designers were influenced by the same things. It was their approach that was different. I’ve heard the 1970s referred to as “the decade that taste forgot.” I think this exhibition can put that line to rest. Last October I traveled to Athens, Georgia to the Georgia Museum of Art. They were having a special exhibition on Emilio Pucci and the business relationships he had with firms in the United States. Pucci had spent some time as a student at the University of Georgia, also located in Athens, and so an exhibition about his US relationships seemed appropriate. While the museum did not allow photos for this show, they did provide a nice place to sit and sketch. I’ve talked about sketching in museums before, and unfortunately, it is not always possible to sit with a pencil and paper and draw. Some museums don’t have benches, and others are so crowded that trying to sketch is impossible. If I’m visiting a new-to-me museum, I will usually take my sketchbook and pencils, but I never know until I get inside if the place is drawer friendly. I also take a small notebook, because sketchy notes are sometimes all that is possible. From my notes and from photos (hopefully ones I was able to take) I then do my journal entry at home. In this case I was able to do the main sketching onsite and then I finished it when I returned home. There is an excellent article in the latest Dress journal from the Costume Society of America about fashion displays in museums and the problems associated with displaying on a static form clothing that was meant to be seen on a moving human body. Author Ingrid Mida brings up some very interesting points about how different it is to see a garment on a mannequin than it is to see it on a human body. In the not too distant past it was considered to be okay for museum garments to be worn by models, but today it is against museum and preservation standards. Museums attempt to make the clothes more dynamic by showing video of the clothing in action, and even, as in the case of the recent John Paul Gautier exhibition, by using animated mannequins. I can see why this would add to the understanding of a garment by people who are viewing it in a museum. At this point I’ve been to dozens of fashion exhibitions, and to be honest, I just expect to see static forms displaying the clothing. But then, I’m all about taking a close look at the garment and noting the details. We all take something different from an exhibition, whether it be clothing or painting or furniture. At this point I’m just glad that fashion is being seen as worthy of exhibition. I can remember a time when clothing exhibitions were very rare indeed. 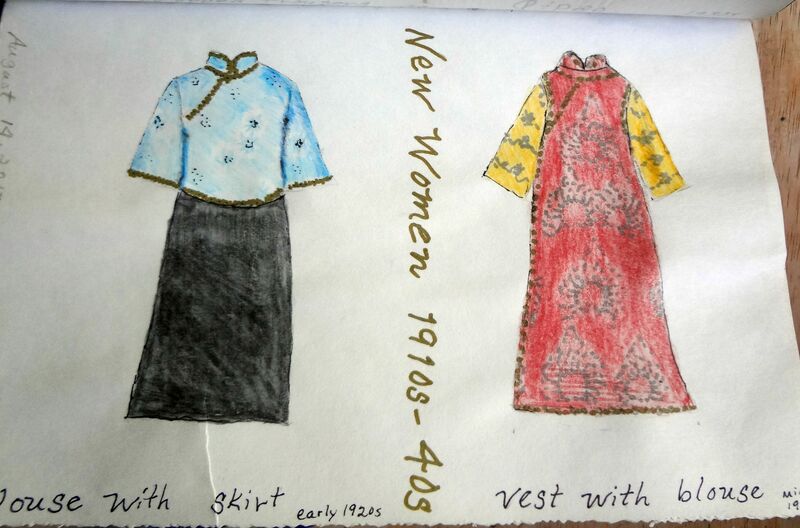 These journal pages are from a visit I made to the Museum of Chinese in America two years ago. In contrast to the exhibition at the Met’s Costume Institute that is currently running, China: Through the Looking Glass which examines Chinese influences on Western fashion, Shanghai Glamour showed how Chinese women adapted aspects of Western dress to create a new style of dress in the early twentieth century. After the end of the Opium War in 1842, the British victors were able to dictate the creation of “trade cities” in China. These cities were made to tolerate a Western presence and were forced to allow trade with them. Shanghai was one of the trade cities. By the twentieth century there were large British, American, and French populations in the city. It was an increasingly cosmopolitan place. 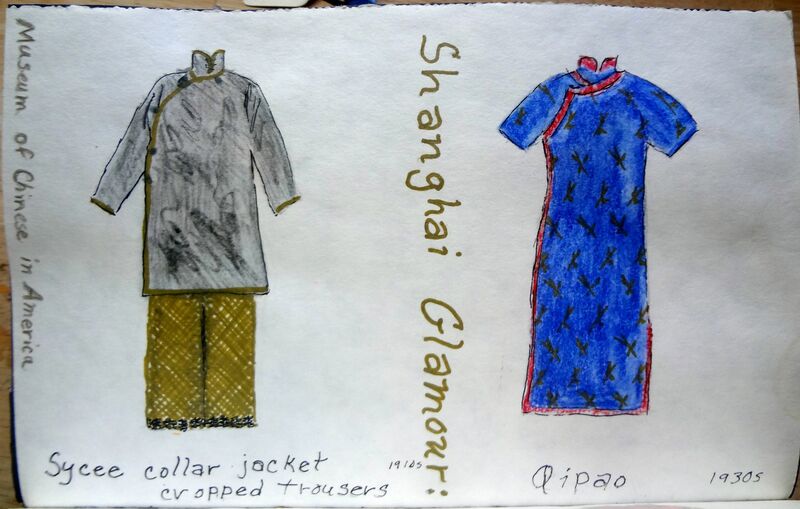 The exhibition showed how the women of Shanghai created their own distinctive style of dress, which was based on Chinese traditional dress but incorporated elements of the West. The look was feminine, but modern. There is a lot of discussion about how Western fashion appropriates different cultures, so it was interesting to see how cultural influences flowed the other way. Sometimes we forget that culture often works on an exchange system. Fashioning the New Woman was an exhibition at the DAR Museum in Washington, DC, held the summer of 2013. 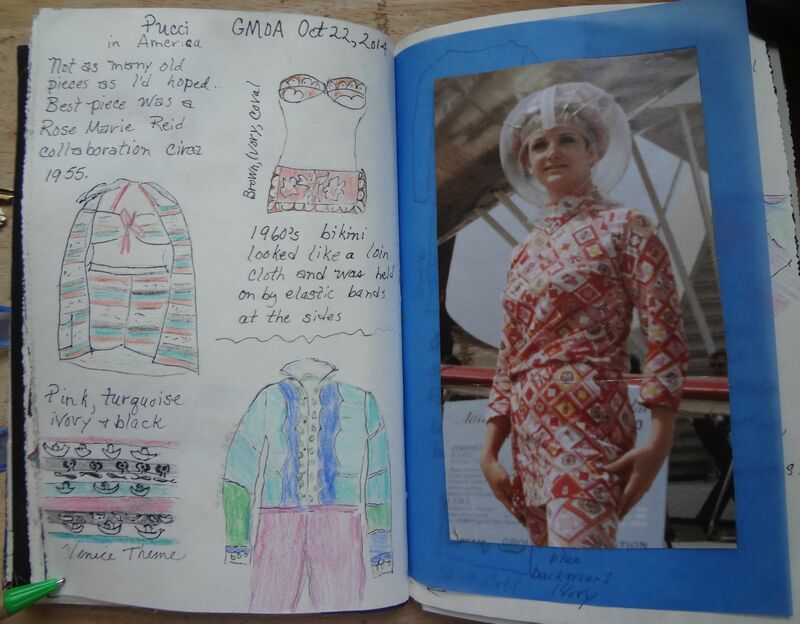 From my journal you can see that the items that were of the greatest interest to me were sportswear. 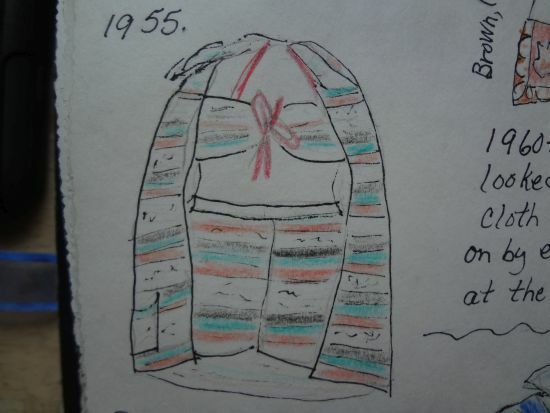 Some of the items, like the gym suit and swimsuit, were fairly common, but others, like the circa 1895 sweater are very rare, even in collections. Sketching on site is often difficult due to crowds and lack of seating, but the conditions at the DAR were ideal. Not only was the crowd light, chairs were provided for people who wanted to sketch or to read the booklets that accompanied the exhibition. 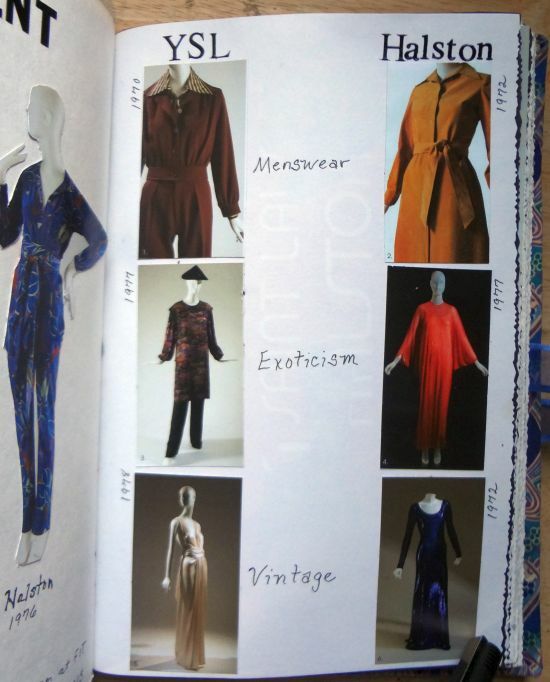 This exhibition was at the Kent State University Museum in 2010 and 2011 after receiving a gift of Katharine Hepburn’s clothing from her estate. Since then the exhibition has traveled, and it is currently showing at the Durham Museum in Omaha, Nebraska. In 2007 the Kent State Museum contacted the estate of Katharine Hepburn as they were interested in acquiring her collection of her performance clothes. The estate administrators agreed that the collection should go to Kent State. There were almost 700 pieces, most of which were identified, but others that needed research in order to identify in which film or play Hepburn had worn the item. Many hours were spent watching films and looking through publicity photographs. There were also items from her personal wardrobe including thirty-one pairs of slacks, many of which were beige or tan. Many of the clothes were so small that special mannequins had to be carved of foam. In order to get a clear picture of how the costumes looked, photos of Katharine Hepburn wearing the costumes were shown as posters behind the displays. The pieces that were on display were the most important and the ones that had, at the time, been identified. I often take my journal on museum visits if I think the atmosphere might be right for sketching. Kent State is rarely crowded, but they do not provide a place to sit, so I only did a few drawings. I know the dress and jodphurs look too long and skinny, but Hepburn was tall, and the waist of her pants measured 20 inches. I did a review on this exhibition soon after I saw it in 2011. I don’t know if it will continue to travel, but if it comes to a museum near you, it is well worth a visit. Almost ten years ago some online friends and I were discussing the newest thing on the internet – the blog. It’s hard to imagine today when there are millions of blogs, including quite a few “written” by cats, that a mere decade ago most people had never even heard of blogging, much less had read or written one. But we were looking for a new way to share different aspects of the things concerning fashion history that interested us. 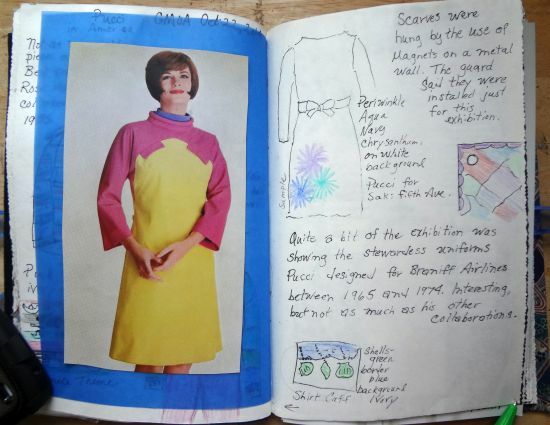 I had started a journal in which I recorded the things I saw and loved at fashion exhibitions. Originally this blog was only scans of the pages from that journal, along with a very few comments. I only posted once a month or so. Soon I began thinking about the other things that I was learning that ought to be shared. I began showing my vintage finds, along with pretty much writing my thoughts out loud. Not that anyone much besides my fellow blogging buddies were actually reading the blog, which was originally called Lizzie’s Vintage Travel Journal. Time passed, my friends went on to other adventures, but I kept blogging. Eventually I stopped showing my journal pages. I can’t say exactly why, but it was probably because I was doing reviews of all the exhibitions I saw anyway. And even though I stopped showing the pages, I’ve kept on making them. I find that physical journaling is a very different activity from writing a blog, even though a blog is a type of journal. 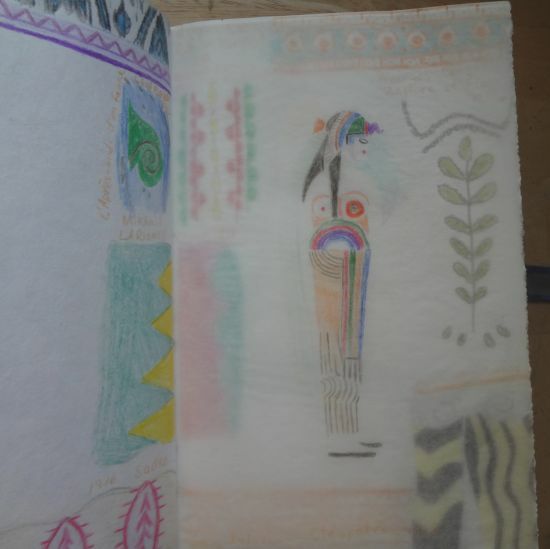 My journal contains many different types of work from drawing to cut out pictures to collage. Many of the drawings are done on site, and if I know that a particular museum is drawer-friendly (in other words, there are places to sit) I’ll take my journal along on the visit. In cases where I know I’ll not have time to stand or sit and draw, the journal stays at home and the pages are made there. In celebration of my ten year anniversary I’ve decided to reinstate the original concept for a day every month or so. I have a lot of exhibits to catch up on from the years when I did not post them. Some are better than others, but all show what I found to be of interest in each exhibition. You can see my older entries by looking at the “Journal” category in the side bar. The first exhibition I’m showing is one that I did not really like, Punk: Chaos to Couture, at the Met. I even had a hard time coming up with a concept with which to work in the journal. Finally, I decided to just focus on two things I found to be interesting. The very early punk tees by Vivienne Westwood and Malcolm McLaren were fantastic, but Widow McLaren claims most of them are fakes. Should I go into the fake punk tee business?